IGRC retired pastor Bill Zander and his wife Nancy were recently honored by the Methodist Medical Center Foundation for exemplary long-term service. The Zanders have served Methodist Medical Center and the Methodist College of Nursing both jointly and individually for more than 25 years. Bill Zander has served as a hospital board member, corporation board member and an advisor to the pastoral care program, which is partially funded by Golden Cross offering gifts. A registered nurse, Nancy Zander has taught and practiced in every area of the profession. Together, the Zanders are emeritus directors of the Methodist College of Nursing board and directed the Methodist Live-In Summer Camp from 1970 to 1977. 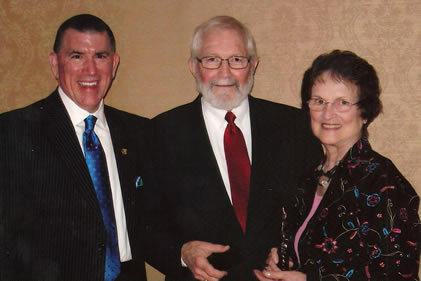 Pictured in the photo from left, are Michael Bryant, MMC’s President and CEO, Bill Zander and Nancy Zander.